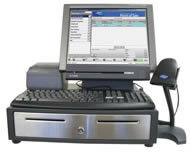 Casio has the hardware and operating systems you need to replace your electronic cash register with an integrated point-of-sale business solution. The QT-8000 PC is sleek on the outside, but it's all power underneath. It features a fast 1.2GHz Intel(r) Celeron(r) processor, 512MB of double data rate memory and 40GB of hard drive space. It also comes equipped with a high-speed 10Base-T Ethernet connection for multi-checkout networks and linkage to back office systems so you can create and maintain the highest standards of productivity and professionalism throughout your entire operation. The QT-8000 PC is ruggedized for everyday use. Even the touch-activated screen is protected by IPXI water splash-proof technology. And all the Casio components are covered by a 3- year manufacturer's warranty. Although the innovative design makes this POS system an attractive option for counter display, its reduced profile and flexible pedestal design gives store owners plenty of options for recessed or wall mounting in tight spaces. * Scan and create bar code labels for accurate, up-to-the-minute inventory tracking. * Improve customer service with faster checkout plus on-screen prices, product information and cross-sells allowing sales associates to answer questions and offer solutions on the spot. * Avoid overstock and out-of-stock dilemmas by tracking purchasing history and accurately predicting future sales trends. * Get real-time reports of detailed sales histories and employee productivity to optimize your company's internal efficiency. * Import all sales and product data captured by your POS system into Microsoft Office(r), Microsoft Office(r) Small Business Accounting 2006 or Intuit(r) QuickBooks(r) for additional data analysis and financial reporting. This page is part of GeneralManual.Com Network Casio QT-8000CWMBD Point of Sale Cash Register User Manual.